Raleigh, North Carolina, May 7, 2008 -- Hillary Clinton told a crowd of several enthusiastic supporters tonight, "damn the torpedoes, full speed ahead" after early results indicated she had lost the North Carolina primary election to Barack Obama in a landslide, and marginally squeaked by in the Indiana primary. 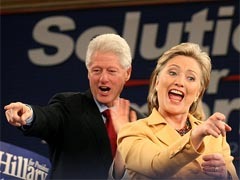 Chicago, February 5, 2008 -- Astounding political pundits from Anchorage to Miami, former president Bill Clinton has rescinded his endorsement of spouse Hillary Clinton in favor of rock star Senator Barack Obama. The endorsement, which some believe may create friction in the suburban Chappaqua home of Bill and Hillary Clinton, was explained by the former president as "a case of conscience over comfort." Washington, D.C., February 2, 2009 -- A mere two weeks into her tenure, President Hillary Rodham Clinton has announced a sweeping roundup of illegal enemy combatants, the first step in a comprehensive program designed to protect the American people from potential terrorist activities. In accordance with the Military Commissions Act of 2006, the nearly one million detainees will be held indefinitely without trial or recourse to legal counsel until such time as the President determines they no longer pose a threat to the United States and its allies. Washington, D.C., November 5, 2008 -- In a dramatic development that has come as a surprise to pundits and the public alike, a youthful technician with Diebold, Inc. has emerged as the unlikely winner of the 2008 U.S. Presidential election. The president-elect, 19 year old Billy Pustule of Green, Ohio, reached via SMS at the garage apartment by his mother's house in which he currently resides, said he was "real psyched about being the president" and "had big plans for the inauguration party". Washington, D.C., May 9, 2009 -- During a short press availability in the White House Rose Garden, President Trent Lott announced today a plan to remake the White House and adjacent National Mall in a manner that "would reflect the glorious antebellum history and culture of the region" by converting the currently open, recreational park spaces to "small-scale agricultural production carried out by entrepreneurial families".